Karen Cloutier is Principal and accomplished leader of Troy CSD’s largest elementary school, School 14. 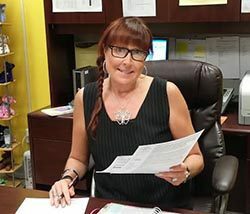 She has been principal here since 2006. Prior to her work in Troy, she served as Assistant Principal at Milton Terrace Primary in the Ballston Spa CSD. She was also a teacher at John L. Edwards Elementary in the Hudson CSD. Karen holds an SDL Certificate, M.S. in School Administration, and M.S. in Elementary Education from the College of Saint Rose. She holds a B.S. in Elementary Education from Russell Sage College. Born and raised in Troy, Karen currently resides in East Greenbush.